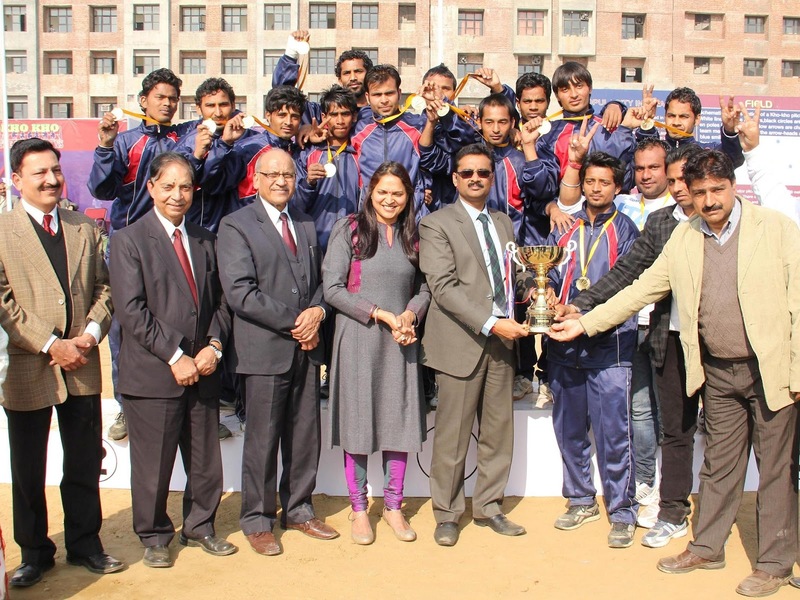 *The four teams will now compete with other zones winners at National All India Inter-University Kho-Kho (Men) Championship, scheduled again at LPU from 25th to 30th Jan 2013. Jalandhar: LPU kho kho players have proved their mettle by lifting winning Gold Trophy of AIU’s North Zone Inter University Kho-Kho (Men) Championship 2012-13. With best of runs, chases, pole dives, attacks, LPU defeated GNDU Amritsar by 14-13 points to become the champion of North Zone’s League matches. GNDU Amritsar & MDU Rohtak won silver and bronze medals, respectively; whereas, PU Chandigarh remained contended with 4th place by losing to MDU Rohtak. Now, these 4 winners of North Zone League Matches will compete with 12 winners of other zones during National All India Inter-University (Inter Zonal) Kho-Kho (Men) Championship 2012-13, scheduled again at LPU from 25 to 30th Jan 2013. On the happy conclusion of zonal matches, very elated LPU Kho Kho team captain Satbeer Madhar expressed: “I and my team members will continue practicing more and more to lift the National Champion Trophy also”. Chairman Referee Board (Punjab) & Qualified Referee for Kho Kho Federation of India, S Mohan Singh said: “I am pleased to see the best of arrangements and discipline at LPU for the organisation of kho kho championship. I and my team of other 18 officials have found the best of hospitality accorded to each and every player and other participant, which will surely help the promotion of this game.” Team Managers & Coaches Ravinder Singh, Rakesh Kumar, Rajesh and Satpal told that strong efforts are being made to get Kho-Kho players to be considered for recruitment in government and private sectors. Nowadays students often select IT as their major in the universities. They fond of getting new things about computer science. It is nice because essayshark is the right way to progress and beat others in the field of technology. 19216801 :An IP address is a captivating product of modern computer technology that is basically designed to allow one computer to communicate with another via the Internet.